This may be the worst-kept secret in Disney history. While "leaks" and rumors from Disney cast members are fairly common, how often does the company's Chairman spill the beans? Michael Eisner did just that at Disney's annual stockholders meeting back in March. Yes, rumors of a new thrill coaster (or even an entire thrill "land") for Disney's Animal Kingdom have been circulating for a while, but many of us were astounded when Eisner volunteered the information from the podium. When Eisner then asked Disney President Robert Iger whether he should have said something, Iger replied, "Youve just made a couple hundred people on the Internet happier than they have ever been in their life!" However, when this reporter called Disneys Media Relations office to confirm Eisner's statement, Disney representatives firmly denied that anything resembling Expedition EVEREST had been officially announced. "What about Mr. Eisner's statement?" "Nothing has been announced officially." "Is that the 'surprise announcement' you'll be making at Animal Kingdom on April 22?" So, the Media gathered eagerly at 9:00 am, Tuesday April 22, to mark the fifth anniversary of the opening of Disney's Animal Kingdom. After a musical, character-filled introduction, Walt Disney World President Al Weiss stepped to the podium. Naturally, the parks anniversary celebration came first, so after appropriate words and ceremony from Weiss and the parks vice-president, Dr. Beth Stevens, the big "surprise" finally arrived. A mountain began to rise behind the stage, like a volcano rising from the sea. Perched atop the flat, fabric cut-out mountain was a terrified Mountaineer Goofy. As the mountain and The Goof rose higher into the air, blustery, snow-filled winds began to buffet the peak. With Goofy clinging desperately to the mountaintop, Al Weiss returned to the stage, clad in a mountaineering parka. He took a few minutes to briefly unveil the big secret, Expedition EVEREST (surprise, surprise) and brought in Imagineer Joe Rohde, Animal Kingdoms lead creative force since Day One. Rohde, too, was warmly dressed in matching parka and wore his trademark, feather-festooned hoop earring. Rohde enthusiastically described the new, $100 million coaster; set to arrive in late 2005 (all other Disney statements say simply, "2006." As seen in the conceptual drawing, a railroad engine pushes several passenger cars up a long, steep slope, only to disappear into a dark tunnel at the mountains very peak. We have no idea of what goes on inside. What we do see is an equally tall and steep track exiting the mountain in another direction. Only now the train is going backwards!
. He's a huge, HUGE, gigantic shaggy creature as real as we can bring him to life." With colorful presentations like this, its no wonder he has so much success ushering his projects through the corporate maze! If some of this sounds familiar, then you must be a dedicated Disney parks fan. Disneys very first mountain, the Matterhorn at Disneyland, is a coaster that winds in and out of a tunnel-riddled mountain. Inside an icy cave, riders come face-to-face with a red-eyed Abominable Snowman. (A Yeti by any other name would look as fierce.) Big Thunder Mountain Railroad (Disneyland and Magic Kingdom) offers-up a runaway train, and Space Mountain encloses an entire coaster in darkness. The only thing missing from these mountains seems to be a backwards drop. Flume ride Maelstrom at Epcots Norway pavilion contributes that element, when riders encounter a troll in the darkness and are hurled backwards down a short slide by the creatures spell. A more terrifying prospect is some of the newer thrill coasters at non-Disney parks, which incorporate far steeper and longer backward drops than Maelstroms gentle sploosh. And surely Audio-Animatronics fans are thinking of the terrifying encounter with a ravenous carnotaur on Animal Kingdoms own Dinosaur. Will Disney Imagineering be able to build upon all these elements to make a state-of-the-art, story-spinning coaster attraction? The new attraction will be located between Asia and Dinolands Tarzan Rocks, in the undeveloped area along the banks of Discovery River. Part of the development will add a direct pathway between those two lands. (That path will be especially welcome at parade time.) While it doesnt have a formal pre-show area, this FASTPASS attraction will have an elaborate, covered queue area, similar to the queue for Asias Kali River Rapids ride. While on the queue, guests will be exposed to rich architectural and decorative elements, learn about the expedition they are about to join, and maybe encounter terrifying rumors about a mythical beast. This will be a "family" coaster, so while it has its scary moments and at least one steep drop, it will probably be less extreme than Rock n Roller Coaster. But "family" doesnt mean it wont be fast, or include steep drops. It sure will! The big drop will be 100 feet tall, roughly twice the height of Splash Mountain (sorry, Jennifer!) Still, the restraint system will be limited to an advanced-design lap bar, rather than the over-shoulder systems of extreme coasters, and the ride will probably have a 44" height restriction. Health warnings should be typical for Disneys mountains, but have yet to be determined. Appropriately enough, we were left in the dark about most of the track design and story elements ­ the parts hidden inside the mountain (and most of the ride will be indoors). Luckily, have plenty of time to uncover more details before the ride is finished. The attraction team also couldnt tell us how long the ride would lastits just too soon. 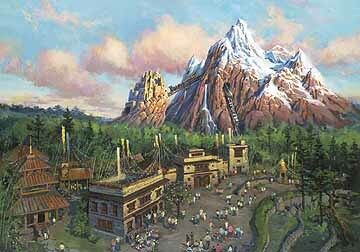 We can all look forward to dining on the terraces behind Flame Tree Barbecue, gazing across the water as a new mountain rises across the water.